Islamic City Hospital is established by the effortless struggle of Dr, Hafiz Bilal Rabbani on the Tulambah Road Mian Channu. It is splinted example of serve the people. Dr, Hafiz Bilal Rabbani has been serving the people since last fourteen years. He is very polite sincere and well mannered doctor. 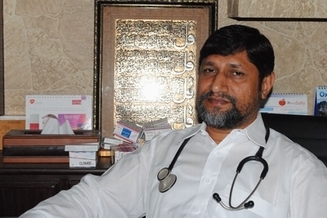 He is the expert of infertility of females, he is also a good surgeon and gynecologist. Islamic City Hospital is situated at peaceful place. Patients are treated indoor / outdoor in this hospital. Facility of ultrasound is also available at this hospital. He is keen to diagnose the diseases. Staff of clinical lab is very expert and trained. Atmosphere of the hospital is very clean and healthy. There are one male and one female wards in the hospital. Alternate system of energy is available in the shape of UPS and generator. Free medical camps are also arranged often in the hospital on every Sunday. Free treatment and medicines are provided to poor people.